1. Griddle the frankfurters for 7-8 minutes, turning halfway, until cooked through. Meanwhile, heat the oil in a saucepan and gently fry the onion for 4-5 minutes. 2. Drain and rinse the lentils and cannellini beans, then add to the saucepan and cook for 2-3 minutes. Stir in crème fraîche and wholegrain mustard. 3. Heat through for 1 minute. Mix in half of the fresh chives. 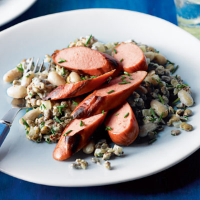 Serve the frankfurters sliced with the lentil mixture, scattered with the parsley.